Pond leaks and how to find them. How much does a pond lose due to evaporation? How often should I be filling my fish pond? If you find yourself searching or thinking any of the above you might have a small pond problem which needs to be fixed. Large leaks in ponds are very easy to identify but most pond leaks are small and can be quite deceiving at first. A small leak in a pond can be a very hard and expensive problem to solve if you do not know how best to tackle it. I myself have fixed hundreds of them in my time. I am always amazed that most people think the best idea is to re-line or re-build the pond. This is true in only a small number of cases and nine times out ten a leak can be fixed very cheaply. I have written this article to firstly help you identify where the problem is and secondly show you how to fix it. 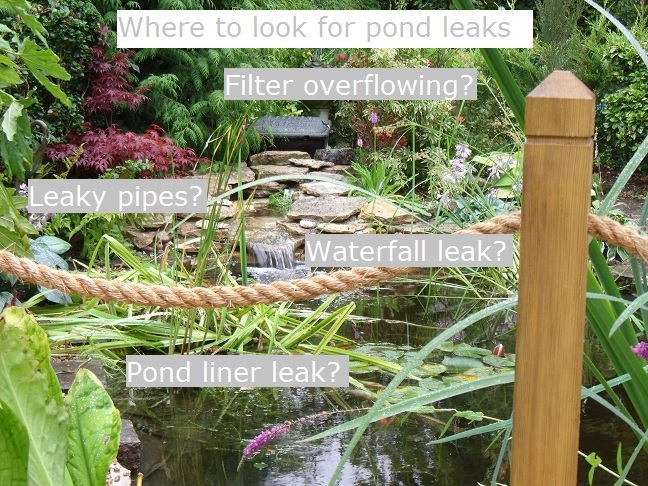 A leaky pond has four possible areas where leaks can occur. 2. Waterfalls, cascades and streams. 3. The pond pipe and plumbing. To identify if your pond has a leak in the liner you must. 1. Switch off your pump or if you have fish, disconnect it from the filter or waterfall overnight. 2. Record how much water you lose. 3. Compare this to how much you lose when the pump is on or connected. If you find the water has not gone down you will know that the problem lies elsewhere. If you find that it has gone down you can be sure that the lining is the problem. Before you proceed to look for the leak you must first identify what type of pond lining you have. 1. Let the water leak out until it seems to stop. Beware, if you have fish this may mean you need to transferee them to a holding tank if the water drops to a depth less than you are comfortable with. 2. Now follow the line of water around the pond looking for the hole and 4 to 5 cm below the water line also. This should take you straight to the problem. To find out how to repair the liner follow this link liner repairs and you may also find this useful types of liner. These types of pond are usually sealed with some kind of resin or pond paint. To fix this you will need to empty the pond and give it a good clean before you inspect it. You first need to check for cracks as this is the most likely reason your pond has leaked. To fix this you will need to cement the crack and re-seal or use a product called just fix it. The second thing to check is the state of the pond paint. If it seems to peel away or is non-existent you will need to re paint it as it has become porous or patchy. A pre-formed GRP pond is the toughest of all the pond linings but can still suffer from water loss. The most common reason a pre-formed pond leaks will be due to a stress in the shape or it may have had a heavy object dropped into it. The best way to fix this is to re-glass the affected area. This can be quite expensive and require specialist knowledge. Before you do this you may want to try covering the area with just fix it or use a liner repair patch, they are not full proof but I have had some good results employing these methods. Moulded plastic ponds can be fixed with just fix it or with liner repair patches. You can use both if you want. They suffer with the same problems a GRP ponds does but are far less common. These are the most common types of lining if you think you do not have any of these then you may need to seek some expert advice. If you have identified that you do not have a leak in your pond lining the next most common place to look is your waterfall or cascade. You must first identify if it is a pre-formed or hand built from stone waterfall. If you have a pre-formed waterfall there can be three reasons it leaks. 1. Debris and plant growth is causing the water to overflow or divert. 2. The waterfall has moved and the water is brimming over the side or falling backwards under the lip. 3. The waterfall has a hole or stress crack. Start by cleaning the waterfall and removing all debris and decorative stones that you may have placed there. Cut back any plants that may have started to grow over it. Check the sides for water channelling elsewhere and under the front lip, then test for a day. If this does not work you may need to check it for holes. This can be very difficult; I would start by using just fix it in the most obvious places. If this does not work remove the waterfall and check the underside or give it a coat of pond paint sealant. A hand built waterfall will always be at risk from movement and cracks. I suggest you start with looking at its general appearance to see what kind of state of repair it is in. If you think it is in a good state of repair you can use the advice above for pre formed waterfalls. In addition to that you can try to repaint the cement work or rebuild parts of it. Unfortunately if this does not work you may need to re-build the waterfall. If you find that it does not have a liner underneath the stone work you may want to add some. This can protect the water loss in the future should it move again. If you have checked the liner and waterfall for leaks and had no luck the next place I would try is the pond plumbing and pipes. You will need to start where the pipe first leaves the pond to go to the filter or waterfall. Follow the pipes checking for weeps, kinks and tears. Check all connections and taps by trying to move them and tighten if needed. If your pipes are buried and you can’t do this buy some similar pipe and run this over ground to the waterfall or filter. This will help to identify your problem without the need for digging and the effort involved finding it. The last most common place to look for water loss is the filtration; this could be a filter, UV or other pond device that has flowing water and pipe connections outside the pond. 1. Check that the filter is level and not overflowing. 2. Clean the filter out and check for cracks. 3. Check the manual to ensure it is configured correctly. Once you have checked these the next place to check is the UV. For a general DIYer I would suggest you take the top off and check for water damage, if you are familiar with UV’s check the o rings and quartz sleeve. If you have no idea what I am talking about (o ring, quartz sleeve) I would suggest you take the unit to your local pond shop and ask them to service and test it. Another way to check would be to buy a hose mender and bypass it temporarily; this can be done with all other pond devices that have water flowing through it too. Water Scenes are a UK pond design and construction company with over 15 years industry expirience. We are well versed in the art of pond restoration and re-design. If you think you pond is the one of ten that needs a total overhual call 0800 0232 988 or email us, info@waterfeaturedesign.co.uk.